This is a lovely dress but I had to return first one and reorder a bigger size. Extremely comfortable and very flattering. Hides all those bumps you need hidden. Would seriously recommend this dress. Lovely dress sizing fine but material a bit clingy. This dress is great for day or to dress up with heels. 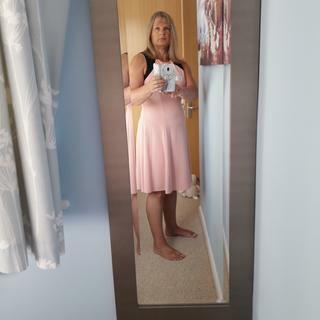 This dress is a true to size fit, I am a standard 12 and it's perfect. Very feminine and the skirt swings lovely just right for my holidays. Lovely dress such good value for the sale price, would quite happily have paid full price. The material is heavier than I thought and is fully lined. Very well made and great on. Very stylish . Nice lengthy too.Love it. Lovely dress very comfortable to wear. Suttle colour pink with a black edging. Suitable for office or wedding wear. Sizing true to size. Lovely length. Black shoes to match finishes it off. I bought this dress at the reduced price and I’m very pleased. The quality is outstanding and colour and fit is beautiful. I wore this dress dancing but could be worn to a wedding or any event with flat shoes or heels. I am very happy with my purchase. I'm very impressed with the clothes from Roman originals ..they are true to size and look lovely. I love this dress it fits perfectly. The colour is as per photo. Lovely dress. The material is lovely and hangs well. Will have to get it taken up very long.